“Don’t be scared, just put it in first gear and gun it!” Lydia See (one of The Cabbage School founders) instructs me as I arrive at the intimidatingly steep driveway of the Cabbage School, located about 30 minutes from Asheville, down a few windy roads in Little Sandy Mush, North Carolina. Maybe it’s the sun pouring in through my rolled down window or the bucolic field of sheep in the periphery, but I am tempted to take this as life advice as well, to set aside fear and move bravely forward. Which is, admirably, what the founders of The Cabbage School seem to be doing as well. A year and a half ago, a small group of individuals, led by weaver and homesteader Jessica Green, gathered to discuss the possibility of creating a place for genuine learning and exploration, where skills could be acquired and large ideas explored. 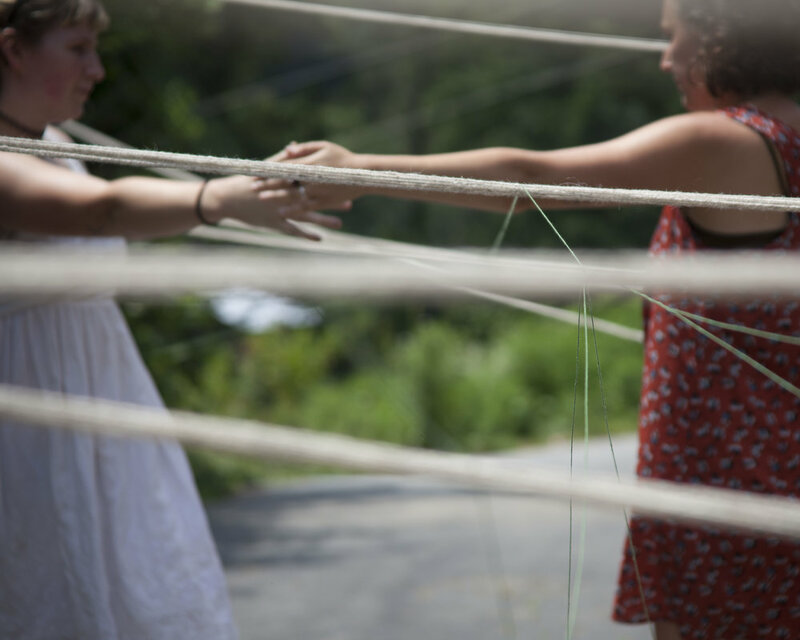 What they came up with is an inspiring educational model, an alternative school for adults, with roots in critical pedagogy and the ethos of places like Black Mountain College and Rural Studio. Most classes are offered over the course of a long weekend and students are asked to stay on site for the duration of the course for a fully immersive, community oriented experience. According to Green, the name was inspired by the many layers of cabbage leaves, recognizing the layers of history present on this mountain. The founders were also inspired by the vegetable’s essential, humble nourishment and versatility–grown all over the world, cabbages can be stewed, fermented, or eaten raw. The name also speaks to the down-to earth, anti-cool, slightly dorky ambitions of the school itself. The Cabbage School convenes for the creation of a resilient and dynamic community and a functional model for learning. This is a space to remember and rebuild new ways of being on this planet while celebrating failure and prioritizing joy. Beginning this June (2018), the Cabbage School will officially start putting these ideas in motion with a roster of classes as diverse as Pizza Oven Building and Counter Logistics and Communist Measures. Cabbage School founders Saralyn Bellmer and Lydia See give me a brief tour of the main building, a 1970s ranch that has been creatively expanded over the years and is currently undergoing a major kitchen renovation. In addition to the large kitchen, the first floor has a small (but well stocked) library, a dining room with one long table and many chairs, and a great room with a wall of mirrors and large windows on either side. The second floor has four bedrooms with plenty of beds, as well as a sitting room with a wall of patio door windows leading to a large second floor patio. We settle in the backyard that has evidence of previous lessons learned, including a tall pole wrapped in ribbons, and a wooden frame structure that looks like it could be the frame for the foundation of a small shed. What motivated each of you to want to start an alternative school? Lydia: I grew up in a non-profit theater located in a state park in Massachusetts. The forest was the theater and our classroom, so I knew from an early age the importance of place and that such alternative learning environments were possible. The mainstream education system in this country is broken; I see a massive shift taking place right now in both education and the art world. People are looking for other ways to learn, ways that feel more authentic and are aligned with their values. I am interested in accidental learning, learning lead by curiosity, where asking sincere questions is encouraged. I am also interested in critical pedagogy and the ideas of educational reformer John Dewey, which inspired the creation of places like Black Mountain College. Saralyn: My background is in ceramics and land-based projects. I have attended a number of the folk and craft schools in the area but am most interested in building community outside of standard systems that incorporate an element of service and a reverence for the land. Who do you think will sign up for classes here? Lydia: We hope to attract a wide variety of people- people interested in a break from their daily lives, people who want to learn a new practical skill, people interested in becoming part of this community. We plan to offer classes that range from technical skill building to more esoteric philosophy or theory. I think a lot of people are frustrated with more structured forms of education and are looking for places to learn that are based on open inquiry. Is the Cabbage School a non-profit? Saralyn: We are hoping to be by the end of the year. We are currently in the process of figuring that out and completing the paperwork. Will all of the operating expenses be supported by tuition fee? Saralyn: It is important to us that our teachers are compensated fairly and that courses are affordable, so once we become a non-profit the idea is to get funding from a variety of sources. We will rent the building to outside groups between class sessions and look for other donors, etc. But yes, ideally we will be primarily supported by tuition fees. Lydia: One of my dreams is to be able to offer fully funded residencies during the off season. This could be a great place for writers or artists who do not need a studio space to work and are inspired by the natural environment. The great room is also set up well for dancers or performers with a wood floor and wall of mirrors. We may one day also be able to offer artist studios. Can students stay here while enrolled in a class? Saralyn: Actually, we request that they do stay here during class so they can have a completely immersed experience. How is your relationship with your neighbors and the surrounding rural community? Lydia: Our neighbors are great. For the most part everyone has been very kind and welcoming. Saralyn: People have been very kind. A number of neighbors have come over to offer assistance with various projects and several of them have participated in our potlucks. Is there any tension between people who have lived here their entire lives and perhaps learned craft skills out of necessity and folks who come here for a day to learn basket weaving for fun? Saralyn: You know if anything I would say the opposite is true. People who grew up around here and learned traditional Appalachian crafts are excited to see young people taking an interest and hopefully keeping some of the skills alive. There really is a great small town feel here. I think it has a lot to do with Jessica living here for several years prior to starting the Cabbage School. She has already developed close relationships with a number of our neighbors. As a queer woman who occasionally fantasizes about living in a rural place, I wonder if you think this place will feel safe and welcoming to queer people and people of color? Lydia: I’m glad you asked this. It’s been a topic of discussion from the very beginning here. I would describe the school, and my own personal philosophy, to be one of radical inclusiveness, so this means that everyone is welcome. Saralyn: It’s true that there are some people in the area with strong beliefs that are different than ours, and it’s very important to us that anyone who attends classes or comes to stay here feels safe and welcome. Lydia: This is an important issue that I am sure we will struggle with for as long as we are here. The work of building equitable and diverse spaces is never “done.” It is on-going and ever shifting. On the topic of diversity, Jessica Green also emailed to let me know that the Cabbage School hosted Earth First Trans and/or Womyn Action Camp this spring ,for which 100 trans, queer radical hardworking geniuses came together to skill share, discuss the state of environmental atrocities, devise how to mobilize against oppression, and build collective power. Green: It was incredibly powerful. It was tricky for some neighbors, but it feels good to slowly expand the capacities of what folks think is possible or normal out here. We hope to keep finding new offerings that foster a wide range of diversity and wild bunches of incredible people–dreaming and doing incredible and surprising things while being nurtured by this mountain and the rural capacity for a slightly less visible mode of organizing. Being able to choose visibility and invisibility can be a very powerful tool. And indeed, being able to melt into the side of the mountain and appreciate the surroundings feels like a much-needed balm for the political injuries many of us have experienced (and continue to experience) as of late. In addition to classes, the Cabbage School also has monthly potlucks on the last Sunday of every month, preceded by a book club. This month the book is, Decolonizing Culture: Essays on the Intersection of Art and Politics by Anuradha Vikram. All are welcome, just email Saralyn saralyn@thecabbageschool.net for directions. Registration is now open for summer courses. See the full list of offerings here.